Summary: In another dimension the Devil King Sadao is close to conquering the world when he is beaten by hero Emilia and forced to relocate to another world, which just so happens to be modern-day Tokyo. Sadao does not have the same powers on Earth that he did in his dimension, and he has to learn to survive in this new situation. To do so, he gets a part-time job at MgRonalds and the rest goes from there. 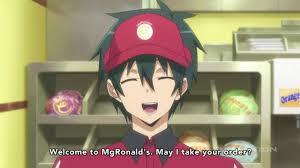 The Devil is a Part-Timer! is a hilarious fish out of water story that blends action and comedy to make a great anime. The devil king was so powerful in his other dimension, but he no longer has those powers. In other words, he is just like everybody else. You might enjoy this if: You enjoy the fish out of water, slice of life, and comedy genres. The devil king performs many acts that just make him look like a crazy person since he no longer has his powers. You might not like it if: You are nit-picky about plot holes and all that business. This is a generally light-hearted comedy and should be treated as such. Note to the Viewer: Pay attention to the spoof names on businesses in the anime, they’ll make you laugh. This entry was posted in Anime and tagged 2013, 8, action, anime, comedy, devil, fast, fish, fish out of water, food, fragglepuss, hataraku, maou, part, review, sama, slice of life, spring, timer, water. Bookmark the permalink. 6 Responses to Fragglepuss Anime Review 8: The Devil is a Part-Timer! / Hataraku Maou-sama!